With registration for the 2016 Tinkerbell 1/2 Marathon weekend quickly approaching, here is a review of this year’s race from Lisa! I decided to register for the Pixie Dust Challenge (10k race Saturday and half marathon on Sunday) at Disneyland in California in May 2015, in addition to running the Glass Slipper Challenge at Walt Disney World in February. Why? The special pink Coast 2 Coast medal! I am a sucker for anything pink, and if you complete the Princess half marathon and the Tinkerbell half marathon, you receive a special coast to coast medal (the normal medal is blue). I also had a chance to get an inaugural medal since it was the first official Pixie Dust Challenge. This race weekend took place over Mother’s Day weekend. We arrived to the expo on Friday afternoon, pretty much all of the commemorative race items were sold out. I did expect it to be that way after my experience at the Princess Half expo, but I was still bummed. So, definitely get there a couple of days early if you are really wanting some souvenir race memorabilia. Running races at Disneyland is a bit different than Disney World. First of all, as long as you stay close to or on Disney property, you can walk to the race corrals. That means no 3:00 am wake ups! We left our hotel around 5:00 for a 5:30 start and I had plenty of time to get to where I needed to be. It was also nice for a Midwestern girl like me to have my body think it was actually 7 am (due to the time zone difference). The 10k(held on Saturday morning)course was awesome. We spent most of the race in the actual parks. I decided not to stop for character pictures this time around, but I had to take advantage of a cast member with no line on the back side of Sleeping Beauty’s castle! You will also notice I didn’t run in costume. There were some great ones, but I decided this time I would stick with a tank top and running skirt. Since it was Tinkerbell themed, the amount of people running with wings on was probably greater than those of us who didn’t My favorite costume I saw was a guy dressed and painted up like Hades from Hercules. That is dedication right there! This race course takes you through so many great areas for pictures, aside from pictures with characters. The half marathon is run on Sunday morning. The course was nice, with the first half of the race in and around the parks, then through Downtown Disney. We ran quite a bit around Anaheim after leaving the parks, so the crowd support wasn’t as big as it was at the entrance gate and Downtown Disney. Spectators were not allowed inside either of the parks, so we only had cast members cheering us on. They had marching bands and dance teams and cheerleaders on the streets around the parks to help keep us motivated, too. There were barely any hills and I appreciated that a lot. Once again, I didn’t stop for pictures, but I did have to stop for a quick selfie with the Lost Boys! In the end, I finished under the time I wanted to, so I was pleased. I really enjoyed my Disneyland experience and can’t wait to run another race there! Or maybe I just can’t wait to eat another Monte Cristo sandwich at Blue Bayou. Or see World of Color at California Adventure. Either way, I highly recommend the Tinkerbell half marathon! Hope to see you all there in 2016! Disney is famous for it’s food, whether it be at Walt Disney World Resort in Florida, Disneyland in California, or at any other Disney destination. You can find unique eats across resorts, parks and ships, from sit down restaurants to delight the most sophisticated palates to a simple snack, the options are endless! The team at Marvelous Mouse Travels has compiled a list of our favorite snacks across the parks and resorts. Now, less talk, more food! A favorite among many, this pineapple flavored soft serve treat is available at the Enchanted Tiki Room in Disneyland, Aloha Isle in the Magic Kingdom park at Walt Disney World and at the Polynesian Village Resort. A classic, quintessential Disney treat. 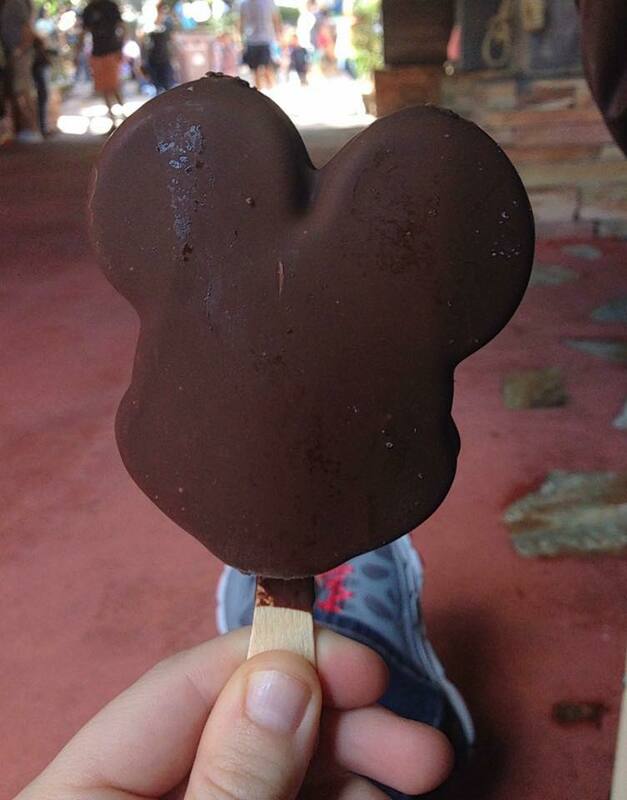 Simply vanilla ice cream coated in a chocolate shell, it can be found at any ice cream stand throughout Disney. Is is a croissant? Is it a doughnut? It’s both! Covered in cinnamon and sugar, this flaky delight can be found at the Refreshment Port in Epcot. You can get it on it’s own or a la mode. Found at Sleepy Hollow Refreshments in the Magic Kingdom park, this treat starts with a fresh, hot waffle, slathered in Nutella, and topped with fresh blueberries, strawberries and bananas is most amazing. Bonus, the fruit means it’s healthy(at least that’s what I tell myself)! Candy apples at Disney can be found in many sweets shops. They come in many different shapes and characters, and are each so well done, it almost makes you not want to eat one, to avoid messing up the careful work to create each one. The key word there is almost, because they taste as good as they look! Or as I like to call them, fluffy pillows of sweet heaven. Found at Port Orleans French Quarter Resort in Walt Disney World and in shapes of Mickey’s head at the Mint Julip Bar, as well as Cafe Orleans, in Disneyland, these are cooked fresh and topped with powdered sugar. During the Halloween season, pumpkin flavored beignets can be found at Disneyland. They are enough to make Tiana herself proud! Try the grey stuff, it’s delicious. Don’t believe us, ask the dishes! This treat tastes like Oreo mousse, and can be found on it’s own or on a cupcake at Be Our Guest restaurant in the Magic Kingdom. Whether you are wanting a standard sundae or the mack daddy of them all, the Kitchen Sink(with 8 scoops of ice cream and more toppings than you can count), Beaches and Cream at Disney’s Beach Club resort has what you are craving. Think you could take on the Kitchen Sink? Whether a pre-packaged decorated treat found at pretty much any gift shop on property, or one you make and top yourself at Goofy’s Candy Kitchen at the Downtown Disney Marketplace in Walt Disney World, this classic treat is simple yet satisfying. Make sure to load up on them and bring them home, so you can enjoy a taste of Disney after your trip ends. Found at pretty much every park, with different flavors and dipping sauces, don’t let looks deceive you. While just a snack, this pretzel fills you up, so be sure to share! Found at the Boardwalk Bakery along the Boardwalk at Walt Disney World, two already amazing desserts are combined, with a layer of moist brownie on the bottom and cheesecake on top. A personal favorite of mine, I even stopped in during the middle of the Enchanted 10k in 2014, and carried my boxed treat across the finish line. It’s that good! So there’s are list! What do you think? Did we leave your favorite treat out? Let us know below! A little confession before we break down one of my favorite ticketed events on Disney property: I’m not a Halloween girl. I struggle with the concept of being scared for fun, and I’m still overly traumatized from an incident involving baby bats and an old church when I was 2 years old. To this day, I can’t watch the movie Batman and even cartoon bats make my skin crawl. And when I heard that the cast member costumes for the Halloween events at Disney were a purple bat pattern? I was not sure that I could participate. So how in the world is Mickey’s Not So Scary Halloween Party my favorite event in all of Walt Disney World? Three years ago, a friend and I decided on a girl’s weekend at WDW, to visit the Food and Wine Festival, and when we realized we would be there the same time as the MNSSHP (the fun acronym by which I’m going to refer to the party from here on out), we decided, why not? Not only were the kiddos dressed up in their Halloween best, but the adults were rocking some fantastic costumes as well. We saw a family dressed as Madame Leota and the three hitchhiking ghosts. We made best friends with a girl dressed full out as Jasmine and her boyfriend as Jafar. But my heart was done in when I saw a lady dressed as Belle. Not just any Belle. Full-out-ballroom,-yellow-dress-with-intricate-details-ready-to-meet-the-Beast Belle. It was in that moment I vowed to return the next year, and I was going to do the Halloween party up right. Over the next two years, I returned as Walking Ariel and Provincial Town Belle, complete with meeting my idols, wearing their garb. That’s what so amazing about the Halloween party. It helps those of us who don’t love the scary part of Halloween celebrate the holiday with the fun stuff: costumes, candy and a whole lot of Disney. It’s one of the only times of year where adults can wear costumes into the parks and people take the opportunity seriously. The party isn’t just about wearing your Halloween best. MNNSHP is also the home of one of Disney’s finest parades, the Boo To You Halloween Parade. Warning: be prepared to have this catchy theme song in your head for weeks after you depart from your Disney vacation. The parade in total lasts about 20 minutes but is worth the price of admission. Dancing ghouls from the Haunted Mansion, characters in Halloween costumes and country cowboys line the streets for a performance you won’t want to miss. The highlight of the parade, though, is the gravediggers. These guys light up the streets with their shovels, literally. Sparks fly as they dance and scrape through the parade route. It’s jaw dropping. Trick-or-treat stations are abundant throughout the park, and there’s even a villain dance party at the main stage in front of the castle. And new this year! The stage show will be themed around the Disney classic ‘Hocus Pocus.’ I can’t wait to see what fun Winifred, Mary and Sarah have in store for the Kingdom. And you can’t close out the party without seeing Hallo-Wishes. This fireworks extravaganza lights up the sky behind the castle set to some of the most villainous music from Disney movie history. And my love of all things mermaid is satisfied as Ursula has her own segment, complete with a rendition of “Poor Unfortunate Souls” with the best fireworks spectacular I’ve ever seen. And if your family is dying to meet Tarzan, the Seven Dwarfs or some other elusive characters, these parties are THE time to give your autograph books a workout. Disney does a great job of bringing out those special characters you can’t meet every day! Last year, Disney offered a special Villain Soiree inside of Cinderella’s Castle. Lady Tremaine and the stepsisters invited some of their favorite evil friends to take over Cinderella’s Royal Table with some fantastic desserts. This was a separate price on top of the party, but in my opinion, it was worth it. I got up close and personal with the Evil Queen. The verdict is out on if this is returning for 2015, but even if it doesn’t there are some amazing treats that you can only find at the party. We spotted some bat-shaped cookies at the Confectionary, but obviously, my bat-phobia prevented me from partaking. I did enjoy my ghost sprinkled rice krispie treat though! So that’s how this Halloween-hating girl became the MNSSHP’s biggest fan. My friends and I are still contemplating our costumes for this year. I’m personally dying to channel my inner Wilderness Explorer for an “UP” theme. So, make plans to attend this fantastic event this fall at the Magic Kingdom. But if you do, don’t be afraid to have a killer costume prepared. You’ll fit right in. On the eve of registration for the Disney Princess 1/2 Marathon in 2016, here is a recap from Lisa of this year’s race! It is one of my bucket list items to run all of the half marathons Disney offers (though that list keeps getting longer as they keep adding more races). A couple of girlfriends and I decided to make a long weekend of it and tackle the Glass Slipper Challenge (10k race on Saturday, followed by the half marathon on Sunday). We had such a blast! We all love Disney, so we did all the parks in addition to running the races. We arrived on the Thursday before race weekend and headed to the expo. Definitely get there early. We were lucky to be able to purchase the items we wanted, but by that evening, many of the popular items were sold out (like wine glasses and jackets). Running Disney races in costume is something I had never done, so we all decided to pick our favorite characters to dress up as. I ran the 10k as Minnie Mouse. It was a bit chilly that morning, so the inexpensive stretchy gloves came in super handy, as did the sweatshirt I was able to throw off about a mile into the course (they collect all items of clothing thrown off to the side and donate them to charity). There were some awesome character picture opportunities on the course, too! My friends and I even got our picture with princess Minnie Mouse tweeted on the runDisney twitter account! We felt super famous. The morning of the half marathon was much warmer (thank goodness), but that also meant humidity. It made for a more difficult finish to our race, but we were racing for fun and pictures, not so much for time. I dressed as my favorite princess, Belle! My favorite part of Disney races is running through the castle. This year, they had Anna, Elsa, and Kristoff on the balcony in the back. They were encouraging all the runners over microphones and it made for a lot of people stopping to take selfies (myself included)! I also loved the funny signs people set up along the course. This one was super fitting for my costume! In the end, even though it was a little more hot and humid than my preferred running temperature (and being from the Midwest in the winter, my body was not used to that weather! ), it was an unforgettable experience! Disney races really are like no other. Added bonus, you get to enjoy your choice of pretty delicious food when you are done (our choice, nachos and a frozen mojito from Mexico in Epcot). Can’t beat that in my opinion! And let’s not forget about the bling…I added these 3 pretties to my collection. (Another tip…we carried our bibs around the parks and had princesses sign them!) All the hard work and training was definitely worth it! I highly recommend the runDisney Princess Half Marathon weekend to everyone, runner or not! It was a fantastic time and I can’t wait to do it again! Disney on a Dime? Yes, it is Possible!! Generally speaking, when the kids are out of school Walt Disney World is crowded….. and more expensive. If you have a flexible schedule try to take advantage of off peak times to visit. September and early November through mid December (with the exception of Thanksgiving week) is a great time of year. Disney is constantly releasing promotions. Take advantage of them and save some money! No one knows better about what promotions apply to your travel than your Authorized Disney Travel Planner. Consider passing on the Hopper option when purchasing tickets. While this option provides guests with flexibility it may not be necessary for those families traveling on a budget. At $64 per ticket, forgoing this option can save a family a few hundred dollars! Does your family require a stroller? Don’t want to bring your own? At $15 a day for a single stroller and $31 a day for a double stroller rental costs can add up quickly! Consider renting from an outside company to save $$$! Don’t Break the Bank Purchasing Souvenirs- Set a limit for the kids before you go. Purchase a gift card for each child and encourage them to choose what they spend their money on wisely! Use an Authorized Disney Travel Planner! Most Authorized Disney Travel Planners provide their services at no cost to their clients- they are paid through Disney directly. Authorized Disney Travel Planners have the knowledge and expertise to book your family in an appropriate room and category that will meet your needs and budget! A good agent will continue shopping promotions for their clients even after they have booked and will automatically apply them to clients reservations to save them money! For more tips and tricks when it comes to saving money on your Disney vacation, check out our Facebook group! What’s your best tip for saving money at Disney? Comment below and let us know!